Coincidentally, this burying of the hatchet between Volney and Ramlogan took place exactly one year after Opposition Leader Dr Keith Rowley raised questions in Parliament about senior government officials being implicated in the Section 34 fiasco. The contents of email documents which Rowley referred to when he raised those questions, are still being investigated by the Police Service and the Integrity Commission. At the start of the briefing, Ramlogan announced that he and Volney had agreed to settle a legal matter which he had brought against Volney for defamation of his character with respect to Section 34 in February. Volney had alleged at that time that Ramlogan was the chief architect of a conspiracy to get him out of office. Ramlogan said as part of this agreement, Volney had agreed to pay an undisclosed sum of money to an undisclosed charity of his choice. When the Administration of Justice (Indictable Proceedings) Bill was passed in the House of Representatives on November 18, 2011, Volney responded to Opposition concerns about the early proclamation of Section 34. The clause proposed the dismissal of cases before the courts for ten years. At the time it was not determined from what date the ten years ought to be determined. “While this measure can work without rules because it establishes a framework, I can assure Members opposite that nothing is going to be proclaimed before all the necessary measures required to make it succeed happens,” he said then. The bill was passed in the Senate on November 29, 2011while the country was under a state of emergency. Before the midnight curfew, Volney tabled a new Section 34, dating the ten years from the date of alleged offences. No senator spoke or objected to this amendment at the committee stage. However, nearly a year later it emerged that Section 34 had been assented to by then President George Maxwell Richards on August 31, 2012, when the country was in the midst of celebrations for the 50th anniversary of Independence. Reports surfaced that the law had implications for the corruption charges stemming from the multi-billion dollar Piarco Airport project against businessmen Ishwar Galbaransingh and Steve Ferguson, known financiers of the United National Congress. Government was alerted by the Office of the Director of Public Prosecutions and took steps to repeal the controversial law. Galbaransingh and other persons who had ten-year-old cases appealed in the High Court the repeal of Section 34. That matter is still ongoing. Prime Minister Kamla Persad-Bissessar subsequently fired Volney as Justice Minister on September 20, 2012 for giving the Cabinet improper advice regarding the proclamation of Section 34. Yesterday, Volney stressed that Ramlogan, who as AG is the legal adviser to the Cabinet, had nothing to do with Section 34 other than being a parliamentary colleague who assisted him during the Senate committee stage in November 2011 to bring about the necessary changes to the clause. Volney said it “was obviously an oversight and without the necessary information from the Office of the Director of Public Prosecutions (DPP),” he was unaware of the fallout which could occur. “I should have undertaken more careful consideration of the proclamation, which I did not,” Volney added. Declaring that he wanted to put the “Section 34 bogey of this Government behind the country so that we could move forward,” Volney said he believed he could still contribute to improving the criminal justice system “on a strict extra judicial or juridical basis” to help bring crime in the country under control. He later told Newsday he was “retired” from politics and had no desire to rejoin the United National Congress (UNC) or the People’s Partnership coalition which the UNC leads. Volney was elected MP for St Joseph on a UNC ticket in 2010. He was expelled from the party and the Parliament and his seat was declared vacant in October 2013, triggering a by-election in November won by the PNM’s Terrence Deyalsingh. Ramlogan said notwithstanding his defence, there were attempts by some persons “to create political mischief and to maliciously try to spin that Section 34 tag on my office and on me personally.” He reiterated that he “had no role or involvement in that matter” because it was not a matter that fell within his ministerial jurisdiction. Persad-Bissessar said Ramlogan was out of the country when a meeting took place with Chief Justice Ivor Archie, Volney and other persons at the Hall of Justice on July 24, 2012 pertaining to the proclamation of the Administration of Justice (Indictable Proceedings) Act. Ramlogan, according to Persad-Bissessar, returned to TT on August 4, 2012. Volney brought a note to Cabinet on August 8, 2012 to partially proclaim Section 34. Cabinet gave its approval on August 16, 2012 and then President Richards signed the proclamation, putting Section 34 into effect on August 31. The AG said the resolution of this matter between Volney and himself, does not concern the Prime Minister. “This is a matter that I have personally brought in my own personal capacity as Anand Ramlogan, an AG, to sue for defamation of character,” he said. Ramlogan explained that he did not consult with Persad-Bissessar in this matter but acted on legal advice. He stressed this legal advice did not involve the expenditure of any funds from his ministry or State funds of any kind. “This is a matter that I have brought personally. This is a matter that I felt aggrieved by the comments that were made,” Ramlogan concluded. Everyone knew that Volney was responsible for early proclamation except Keith Rowley. The AG was accused by a mindless and silly PNM mob that is now shown to be ignorant, stupid and unlearned. What is new with these buffoons? I guess if I was given, lets say $10M “to do the right thing” I would consider it. It is obvious that people like Mamoo feel that all they have to do is criticize the opposition in print and wham! bingo! the PP wins again. No, no, no my friend that isn’t so, your word is only ‘believed’ when there is an absence of truth and your word have convincingly taken its place. Failure to do that fails miserably. It is the reason since Jack is no longer with the PP, they fail to convince anybody. The cabal thinks that because they say so, we are supposed to believe that the Anil we saw in the video, is not really Anil. Hell no, we are not that stupid and when a government persist in standing up for lies and pretensions we should not onlynot believe them them, we must act to see them GO. They must be made to pay for the evil that they perpetrate upon gthe people. Ramlogan is a disgrace, Volney? was he a high court judge? well, well, well cobo smoke we pipe. We don’t want a government with make shift characters. We want serious minded bureaucrats who can work to make this country a better place to live in, not people who think only in terms of how to milk the treasury. People have stopped counting “missteps”, we want elections now. KPB is a total failure and the slide downward is too fast and too steep. 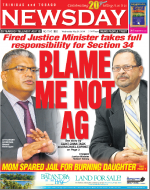 Volney did not accept full responsibility; he groveled. But then, you would not say anything bad about the AG, he does not fall into your non-Indian, PNM or African category. “PNM and Opposition Leader Dr Keith Rowley said yesterday’s march against the Section 34 scandal was done in defence of democracy, speaking at a rally on the Brian Lara Promenade, Port-of-Spain after the street demonstration. Thousands of PNM supporters, trade union members and members of the public met at Woodford Square and marched through Port-of-Spain to call for the firing of Attorney General Anand Ramlogan over the premature proclamation of Section 34 of the Administration of Justice (Indictable Proceedings) Act, and Minister of National Security, Jack Warner, for criticising a reporter. Police estimates put the crowd at 11,000 to 15,000 people (compared to their estimate of 10,000 to 12,000 people for a previous section 34 march held by the PNM). “You walked today because you saw a threat to democracy,” Rowley told protesters. Pledging the PNM to stand firmly behind the Oilfield Workers Trade Union (OWTU), he said in the past trade unions and political parties have had different views on issues such as the smelter, but yesterday there was a common purpose — to protest the Section 34 scandal as a threat to democracy.” Newsday . Lest we forget the “hell” the AG went through because of the PNM mob led by Rowley, smearing the good, proper and honorable name of our beloved AG Ramlogan. Rowley is the worst of the PNM political leaders. Yeah Mamboo, your can do no wrong AG , might be able to force apologies, out of useless , political blowhard Volney, because the man was clearly scared, since he was most likely threatened , with deportation ,back to his native land Dominica, or St Lucia, but as for our longstanding , extremely objective, Media hero ,Dominic Kalipasad? Nunca, Nyet, Non, Noooo! Sorry Auntie K,for as we say on de streets,’hell will freeze over first,’before you get any apology. Can’t love the T&T 4th Estate brigade, when the Op Ed pages , Photo ups,and feel good stories, sway your way, then let loose UNC Wajangs,fake religious, and financial supportive, corporate pit bulls, their way, when they occasionally expose the ugly underbelly , of your UNC dominant ,regime. There are those who would say , and I am tempted to agree, that Auntie K ,should be lucky, her name ain’t George Chambers, or ANR Robinson. Imaging , if someone , had said ‘Kamla Duncy, how to run the country?’In 1990, Islamist goons, almost murdered,’Ah we Bouy,’following the lead of her mentor , Papa Basdeo,who undermined the ‘Castara kid,’ regime, once he Baz,and fellow political goons, were dumped from the NAR. Fast forward to 2014, and phony Coup attempts , are halted, before they are even planned, and we have no idea , as to who should get the credit. Is it local Imams, controlled by the PP, or incompetent, maligned , mico-managed T&T Police, still looking over their shoulder to see if another White boss , would be selected by their Pro European Government, while praying that their Ag Commissioner of Police ,would get his acting title removed ,before PM Rowley, is sworn into office, or disrespectful Trinis , start throwing rotten eggs, at their patrol cars. Speaking of Uncle Rowley, aka de Rottweiler , and aren’t folks happy, he is ferocious …ummmm..takes his job seriously? Nope corruption was never tolerated, when an ANR Robinson was around, and as my late,extremely wise, Tobago Granny would often say-“and worsearah yet,” it definitely , won’t be condoned, by a Dr Rowley, in ,or out of Political Power. How is that Calder Hart affair progressing, by T&T Tribal jingoism Chief…ummm ..Pardon , non functional, yet cuddled AG ? There are folks , still surprise, as to why a selective few , hate these two leaders. 3 months after ANR’s death , Basdeo Panday , is still getting nightmares, and so wakes up , to tweak his still diabolical plots, to destroy dead Robbie. His fellow rum drinking, African Twin brother , Patrick Manning, political house of cards, was destroyed, because of Dr Rowley’s relentless Drone assaults, re the Calder Hart Scandal/ Patios can of worms. Let me put it this way.If Dr Rowley , is caught walking , say around 12:15 am ,near St James, or Cipero street San Fernando, and a vehicle with Manning , as passenger, is driving by. …unnn..well, we know how that script,might play out. Put differently, the Pennelope woman , a not too strong a rival , of the ‘late,’ PM in waiting, Dr Rowley,would , suddenly become the PNM , party boss. The unmitigated gall , of these anti democratic folks, trying to nuzzle our press, and suppress T&T long cherished freedoms! Love it , when politicians overreach. Ah shocks! I was never too good at this rhyming business, and sadly cannot expect much help , from eat a fooders, and kaisonian cowards ,such as Gypsy, Sugar Alloes, Cro Cro, and ChalkDust, who obviously, were never too shy ,to “attack in full force, “when folks who looked like them , once ruled ,the political roost. One thing can be certain, and this is it- Voters that Matters ,knows what to do! The majority, I am certain, are committed, to ensuring , that ‘The Guyanarization of T&T, must never be allowed to occur,’and why? Our flawed, but honest, diligent Founding Fathers , did not wrestle Independence away from divide , and rule , conniving , White European Massas, to have our socio economic , and political rights , freedoms, and principles of human decency , thrown away, like trash, callously dumped ,into the East Dry River, and Caroni River. Time to take a stand , to ensure these morally deprave barbarians, don’t overrun , the Trini Pearly Gates, and in the process , destroy us all.